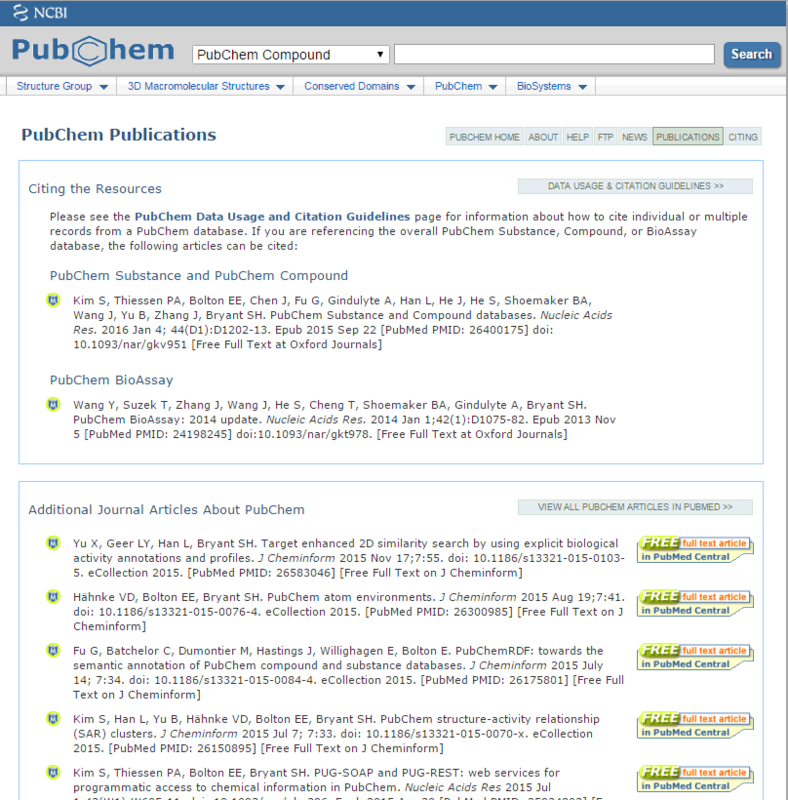 Recent PubChem Publications: Read about What’s New! The PubChem team published an article in the 2016 Nucleic Acids Research Database issue (Kim et al., Nucl. Acids Res., 2016, 44(D1), D1202-D1213, PMID: 26400175). This article provides an overview of the PubChem Compound and Substance databases, including organization, contents, interfaces, programmatic access and other relevant tools and services. Considerable changes have been made since these two databases were described in a previous paper published in 2008 (Bolton et al., Ann. Rep. Comput. Chem., 2008, 4, 217-241), and the newly published paper provides updated information on these resources. PUG-SOAP and PUG-REST: web services for programmatic access to chemical information in PubChem. Kim et al., Nucl. Acids Res. 2015, 43(W1), W605-W611, PMID: 25934803. PubChem structure-activity relationship (SAR) clusters. Kim et al., J. Cheminform. 2015, 7, 33, PMID: 26150895. PubChemRDF: towards the semantic annotation of PubChem compound and substance databases. Fu et al., J. Cheminform. 2015, 7, 34, PMID: 26175801. Hähnke et al., J. Cheminform. 2015, 7, 41, PMID: 26300985. Target enhanced 2D similarity search by using explicit biological activity annotations and profiles. Yu et al., J. Cheminform. 2015, 7, 55. PMID: 26583046. Reporting biological assay screening results for maximum impact. Bolton, Drug Discov. Today Technol.2015, 14, 31-36. PMID: 26194585. PubChem Laboratory Chemical Safety Summary. Kim et al., ConfChem Newsletter, American Chemical Society Division of Chemical Education, Fall 2015. To get a complete list of all articles published by the PubChem team, please visit the PubChem Publication page. PubChem is a free chemical database and an open archive of the biological activities of millions of substances. PubChem is a part of the National Center for Biotechnology Information (NCBI), a division of the U.S. National Library of Medicine. PubChem Homepage has a new look and feel! PubChem pages have a new look and feel!